Shure unveiled the R189 lobar “mini-shotgun” microphone cartridge that threads onto all its Microflex goosenecks and overhead microphones, delivering intelligible speech in even noisy and complex environments. At Integrated Systems Europe (ISE) 2019, Shure announced that its Microflex Complete Wireless (MXCW) Conferencing System is now available. A premier solution in Shure’s conferencing portfolio, MXCW offers wireless freedom and flexibility for conferences, meetings, and events inside government, corporate, hotel, and educational facilities — and more. 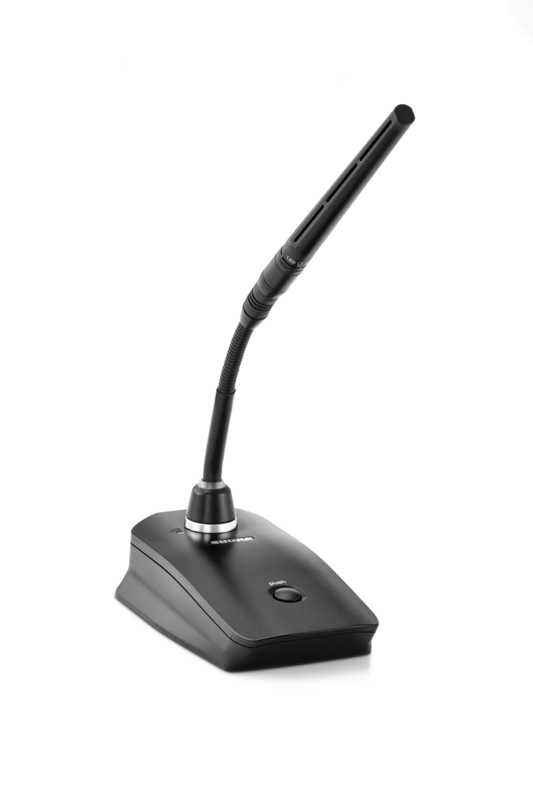 Ideal for environments that need quick, intuitive set-up and breakdown, the all-in-one conferencing solution is dedicated to providing exceptional audio quality, audio security, and ease of use. The wireless conferencing units—which include a microphone, loudspeaker, interpretation audio, controls, and touchscreen—overcome cable restrictions for use in rooms that require adaptable seating, or in historic settings, where permanent installation (like tabletop drilling) is not an option. Of note, most government entities have rooms that are multi-purpose, or multi-functional. From hosting a quick internal catch-up, to committee meetings or large public gatherings, these rooms are used by numbers of people and purposes. Flexible seating — and a corresponding scalable conferencing system—is a must. Additionally, the lack of visible wiring meets today’s expectations for sleek, clean, setup. It also encourages natural interactions between participants who are no longer held back by connections; instead, they can move and communicate without restraint. Because a wired connection is not needed, IT managers and AV professionals can setup and configure the system in minutes. If a last-minute meeting is scheduled, users can just pull out the system and configure it for the gathering. On top of this, Automatic Gain Control technology and proprietary audio codec ensures that MXCWdelivers natural, intelligible audio and consistent speech levels for all participants –resulting in highly productive and engaging discussions. Microflex Complete Wireless leverages the power of Shure’s highly-regarded frequency management technology to eliminate the need for time-consuming frequency adjustments and interruptions. Additionally, MXCW is supported by Shure’s Interference Detection and Avoidance technology for reliable transmission even in the most congested RF environments. Coupled with AES-128 audio encryption for enhanced privacy and one single access point, integrators, and AV professional shave real-time control over the entire wireless coverage area. “The MXCW system is highly reliable, and this is something that convinced me right from the start. Another huge advantage is the Dante option, which allows our customers to integrate the Shure system seamlessly into their existing system environment,” says Matthias Scheffe, Ton & Technik Scheffe Nuembrecht, in Germany.